Villa Capung is refreshingly unpretentious, the kind of place where you walk in, promptly collapse on the sofa and immediately feel right at home (if only home had views like this!). 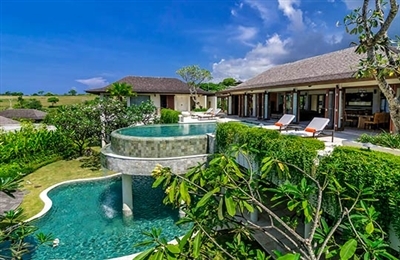 While the villa is not huge, the views of pristine hills and the expanse of Indian Ocean that spread before you create a seemingly endless sense of space, and the villa has been cleverly designed to maximise options for privacy. The master suite is gigantic, while the second bedroom has its own private deck as does the garden suite. The owners spend quite a bit of time here, and have struck a perfect balance between elegance and comfort: this very popular villa feels well loved and lived in. Enjoying the views from the infinity pool was a definite highlight, especially in the soft late-afternoon light, which deepens the colours of the leafy foliage in the garden. However, Capung really comes into its own in the evening when dark amber lamps cast a seductive glow over the living room, accentuating the crimson furnishings. Spotlights illuminate the palms and lotus pond, and the lights of Bali twinkle like a fairyland far below. There is a wonderful heady sensation of being so high up, and the villa seems remarkably good value considering these million dollar views. The staff are efficient and kind, immediately on hand if we needed something, but entirely unobtrusive the rest of the time, and we loved that they can mix cocktails! We loved the element of choice at this villa – the option to be alone and undisturbed with friends and the lovely, caring staff who looked after our every need, or the option to embrace everything that the resort has to offer. We could choose to have private meals served by our butler and cooked by our own private chef, or we could choose to eat at the resort’s fine dining restaurant or at the beach club. Yes, the location is remote but, with the reasonably priced services of a car and driver, it was easy to explore the area. The beach club proved to be fantastic, and fun for people-watching, yet we also had the options of swimming in the resort’s pool and in our own private pool. We really enjoyed our stay at Villa Indah Manis which means “beautiful” and “sweet”. It is a very pretty villa, nicely laid out, with exceptional facilities, boldly coloured bedrooms and well-furnished living and dining spaces. The setting is tremendous for views and privacy (not so great for those seeking exciting night-life or retail therapy) and the staff were absolutely delightful, they could not have been more helpful. The food we had was beautifully presented. 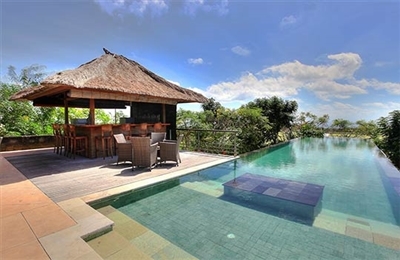 The villa has a more homely intimate feel than many we have seen in Bali, clearly targeting families - for which it is well suited. 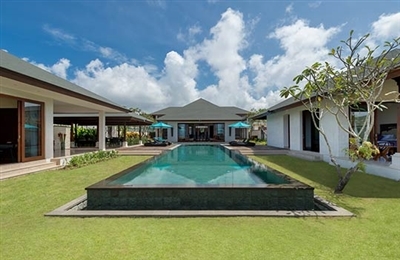 Villa Bulan Madu is a wonderfully romantic little villa. The setting is very pleasant and, given how open the rooms are, very private. 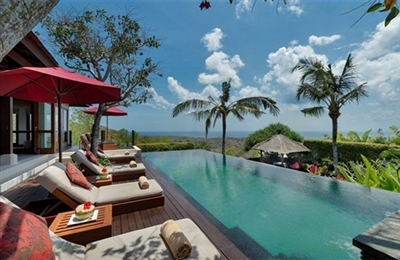 The villa shares the same owner, staff and kitchens as its neighbour, the five-bedroomed Villa Indah Manis, so has the benefit of a large staff who discreetly disappear next door until summoned. For us, the staff could not have been more helpful and the food we had was beautifully presented. What a lovely villa for families with kids! This struck us as soon as we stepped onto Villa Marie’s ironwood sundeck framing the large swimming pool. Small kids will love the huge shallow section conveniently located alongside the living pavilion, and parents will appreciate being able to keep an eye on them from practically every room while blissing out on the ocean vistas and the privacy of two separate master bedroom pavilions on either side of the pool. We think this would be a great villa for six couples too. In addition to the two master suites, the four equally large bedrooms in the two-storey sleeping block each enjoy privacy as well as a small deck or balcony and fabulous bathroom, and the two twin rooms can also be configured as kings; so no short straw to be drawn here! We did notice that neither of the two dining tables had enough room for 12 guests, but have a feeling the highly efficient management team will be onto that pretty speedily. The fabulous facilities of the adjoining Pandawa Cliff Estate sports centre and spa provides an alternative source of entertainment at your doorstep. Air-conditioned squash, anyone? Doubles tennis? (There’s even an umpire’s chair to keep the competitive spirit in check). 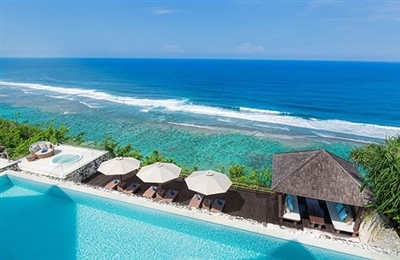 And a five-minute drive in your complimentary car will take you to Pandawa Beach where you can swim, snorkel and kayak in the shallow, reef-protected waters.